1.What is Google UTM Builder? Google UTM builder is a tool provided by Google for free that uses pre-programmed formulas to append unique UTM tracking code snippets to the URLs of website pages, articles, and blogs. 2. Are there other UTM builders? Yes, due to the drastic increase in digital campaigns in recent years, marketing and analytics specialists today use a variety of UTM builders – there is a growing number of manual, spreadsheet-based, or automated UTM building tools. The part of the industry dealing with managing UTM tags [UTM parameters] is called link management. When UTM code snippets are being added to the URL of a web page, the result is a long link. It contains key tracking information enabling the analytics tool, which monitors the page*, to parse it and display it in specific out-of-the-box or custom reports. Tracking links helps marketers answer important questions, such as how many users came to the event registration page from a link included in the weekly newsletter versus a tweet; how many people who came from that newsletter actually registered for the event, etc. The insights that are collected as a result of tracking marketing assets help measure the effectiveness of promotions and channels. Most importantly, this information is used for optimization, where “a marketer can improve marketing campaigns, website creative content, and information architecture” (Wikipedia). The term UTM builder is often used synonymously to URL builder, although, technically, it could be argued that the former enables marketers to create and store custom and standard UTM parameters, while the latter can refer to building URLs by using any kind of parameters. UTM builders could be as simple as a Google sheet, MS Excel spreadsheet, or a very simplified web page. There are sophisticated and fully automated UTM tracking tools on the market too. 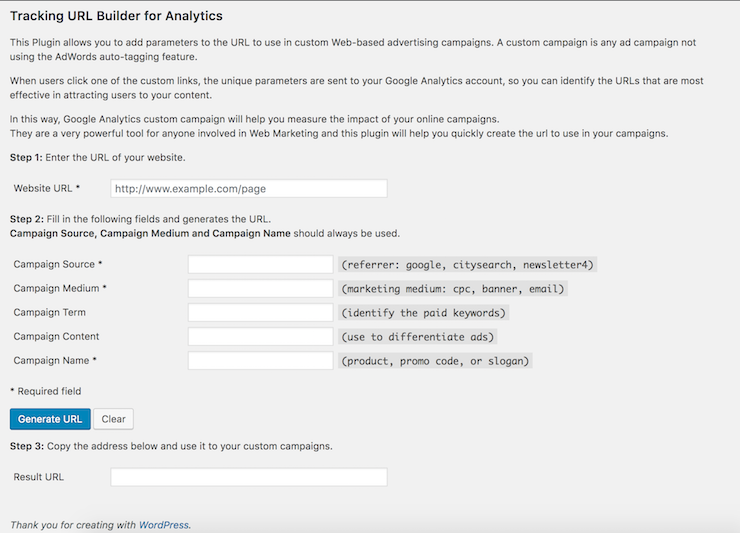 Here is a link to a sample UTM Tags Builder Google Sheet you can use to store your campaign web addresses, add to them select tags, and even shorten them into Bitly links. Just save a copy of the document in your Google Sheets and you can start using right away. All UTM builder tools ultimately relieve marketers of having to manually add tracking information each time they are promoting a page or a blog. The long links are actually regular web page addresses with a bit of code added at the end. They are used by marketing specialists only when they promote certain web pages for their “external” online campaigns. External, in this case, means that the promotion is carried outside of the website on which the page resides. Caution: Never use long tracking links to promote a page within your website, via a banner or internal linking. This will throw a wrench into your campaign success measurement. For internal campaigns, use events or tags. The code in the links helps marketers find in web analytics tools such as Google Analytics and Kissmetrics more detailed information about the visits to the page specifically related to a tracked campaign. In Google Analytics, UTM-tracked links can be found in the Campaigns report, available under Acquisition, as seen below. Because marketers create so many different promotional campaigns every single day, it is not feasible to expect that they will type the codes manually themselves. Manual processing results in errors, inconsistencies, and under-reported campaign performance. Hence, the need for URL or UTM builders – tools that originated from the Google URL builder or Google campaign URL builder and enhanced it further to assist marketers by doing the tedious manual work of creating and adding tags, and generating long tracking URLs for them. The most significant benefit of these automated tools is that save time, boost productivity and reduce mechanical errors that affect the reporting of marketing results. Simple URL builders – the likes of the basic Google Analytics URL builder – they allow us to create a link at a time. Many ESPs (email service providers) and Social Media Publishing Tools like Hootsuite feature simple URL builders on their platforms. Pros: They are free. You can use them as many times as you want to, as long as you process one link at a time. They used to be great 10-15 years ago when digital marketing was in its infancy. Marketers rarely had so many online campaigns and used very limited tracking. Cons: They are on external websites and you have to bookmark them to go there every single time. They don’t remember your information, so you have to type or copy-paste new parameters every single time. Nowadays a campaign can run on 20-30 or more promotional channels. Generating a link at a time is physically impossible to manage – if you need to promote a page on 25 channels, you have to enter your information 25 times!! Spreadsheet-based UTM builders – they can actually churn a lot of URLs in a manner of minutes. Google docs can even integrate with Bitly and shorten as many as 40-50 long tracking links at a time. 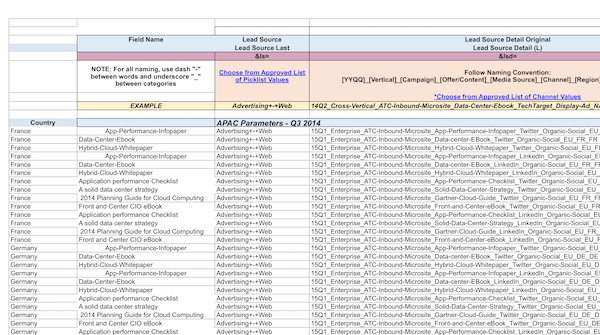 Here is an example of an elaborate tracking parameter generating spreadsheet in MS Excel. It cannot shorten the URLs. Pros: They are free. They are on your computer, so you own them. You control what to add, delete or keep. Cons: Nowadays a campaign requires that the long tracking links be shortened for use in Social Media and other channels. MS Excel spreadsheets cannot shorten links. Users have to resort to other tools, or export all their work on a Google sheet, which has been set up to “speak” with the API of their Bitly account. While this process is manageable, it breaks the UTM tracking into multiple steps, too many copy-pasting steps, and can be quite buggy. Image of CampaignTrackly for Chrome, enabling seamless link tagging, tracking URL generation and link shortening across the web with the ability to auto-save all campaigns and view their performance later. Automated URL builder tools, also known as UTM generator and UTM link builder SAAS tools. They will actually do all the work related to generating, storing, and re-using UTM tags. Additionally, they will also build the long tracking links and shorten them on the spot. Some tools are more sophisticated, all-in-one UTM tracking suites that include a combination of web and browser UTM tagging URL building apps. Others are offered either as browser apps (extensions) or as web apps only. Pros: These tools save marketers a lot of time. They offer multiple benefits – from simultaneous bulk link editing and shortening, to saving all campaigns in one central place and providing easy access to campaign reporting and graphs. Additionally, they help standardize the tracking process and result in better analytics data that leads to improving marketing decisions and better budget spend. Cons: Marketers are still learning how to apply campaign tracking an analytics and need a lot of training and help in order to be able to start using these tools effectively. Additionally, marketers are trying to find solutions that offer more all-round approach to creating, implementing and tracking marketing campaigns. Tools that provide a more global, holistic approach to campaign management will offer the best value on the market. Managing tracking links is a real pain for marketers, especially when you have to generate multiple tracking tags, build multiple tracking URLs, and shorten all links at the same time. simplifying the whole tagging, URL building and shortening process instead of having to go back and forth between multiple spreadsheets and tools. Today, there are quite a few URL building and UTM tracking automation tools available on the market. They pretty much extend the classical Google URL builder by giving it wings and integrating it with numerous apps and solutions to fuel marketers’ productivity. CampaignTail – Offers automated UTM tagging as well as URL generation and shortening automation features. Offers multi-user management, .gov dedicated link shortener, and Google Analytics integration. Its free version does not include Bitly shortening or custom tag use. CampaignTrackly – has a FREE for life version. Plans start at $13.95. (Disclaimer – this is our automated tracking app) The free version generates 1, 100, or 100 UTM tag links in seconds. Has custom and standard UTMs. Comes with over 30 tag pre-sets and is excellent for beginners as it has a user-friendly wizard. Features a Chrome extension that enables you to tag everywhere (automatically parses links and tags them). Integrated with Google Analytics, Bitly, Buffer, Twitter, and LinkedIn. 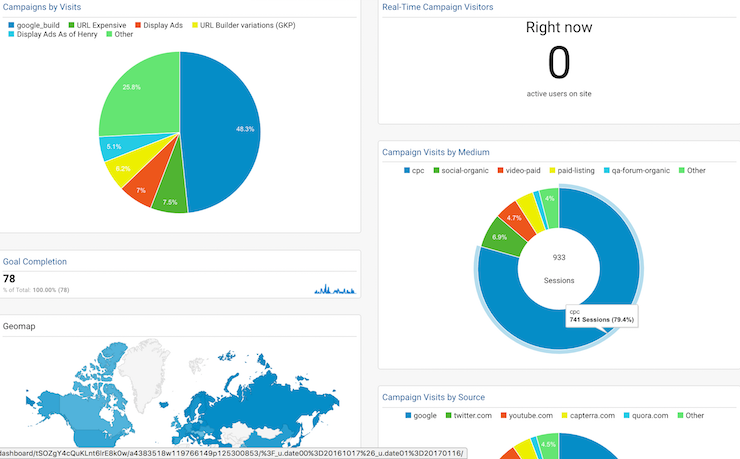 Has campaigns and reports dashboards for all your campaigns in one easy view. Lets you keep all your campaigns for as long as you need and enable you to pre-save/re-use all your tags to eliminate tagging errors. 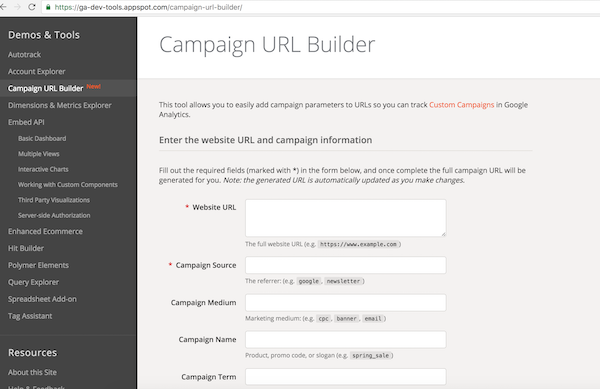 You can also auto-export your campaign links into ready-to-share .csv files. Effinamazing is a Chrome extension only and does not have an SAAS-based dashboard that lets you manage and store your campaigns or view analytics in your account. It is meant for lightweight tagging use it allows you to save your UTM presets. It auto-integrates with Bitly too and lets you export your tags to Google Docs. Terminusapp is an enterprise solution. It fully automates custom and standard UTM tag generation, long URL creation, and shortens your links. Has a weekly email that updates you on your campaign status via a REST API. It has a 21-day free trial, no free version, and caters effectively to the larger enterprise businesses and agencies with multi-user and complex project management. Excellent for large teams. Personal plans start at $29. It offers reporting and has a Chrome Extension. Tracking First is a solution that supports Adobe Analytics users. It offers a tracking code generator, lets you automate your SAINT classification management, validate links, and offers accounts for teams. Whysr – another automating UTM tool that offers pretty similar services. It has a free version, and its paid plans start at $29.99, which include Google Analytics connection. They also have a “tag anywhere” extension. Want to measure the REAL impact of your marketing campaigns? Start using our fully automated all-in-one UTM tracking suite. *UTM tracking code or parameter use is primarily related to Google Analytics, the most popular analytics tool, estimated to be used on up to 50 million websites worldwide, according to Marketing Land. However, industry expert Adam Greco states that “the way campaign tracking is done in GA has almost become the industry de facto standard.” He and other analysts are using UTMs with Kissmetrics, Adobe Analytics, and other popular analytics software.